If worker exploitation gets too expensive or difficult, Uber and Lyft promise a deus ex machina will ride to the rescue: the robot car. Uber (on its own) and Lyft (with big-league partners) are both investing heavily in driverless car technology. They are joined by Apple, Amazon, Google, and all of the major car companies. Despite continued enthusiasm and massive investment, sober analysts put the prospects of driverless cars far out into the future. The bottom line, however, is that automobiles remain incompatible with the smarter, greener, congestion-free cities ride-hailing evangelists promise. Ridesharing increases travel by automobile and increases the number of vehicle miles traveled. It has already made bad traffic congestion worse. Replacing human drivers with robots changes none of those facts. That means even if the staggering losses turn into staggering profits, the fairy tales in which these companies carry us over the peak and down into an urban landscape so efficient that no one needs to own a car will never come true—and the decacorn will be revealed for the mythical beast it is. 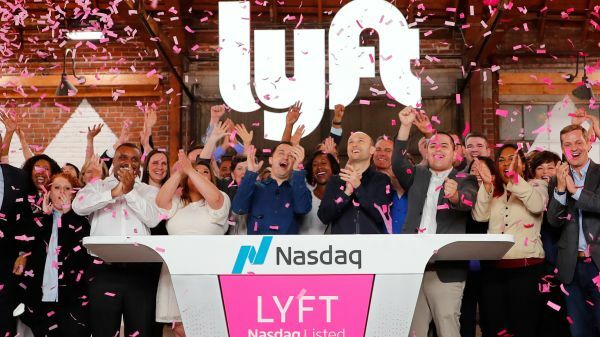 Image: Lyft’s IPO begins trading on the Nasdaq, March 2019. Via CNBC.